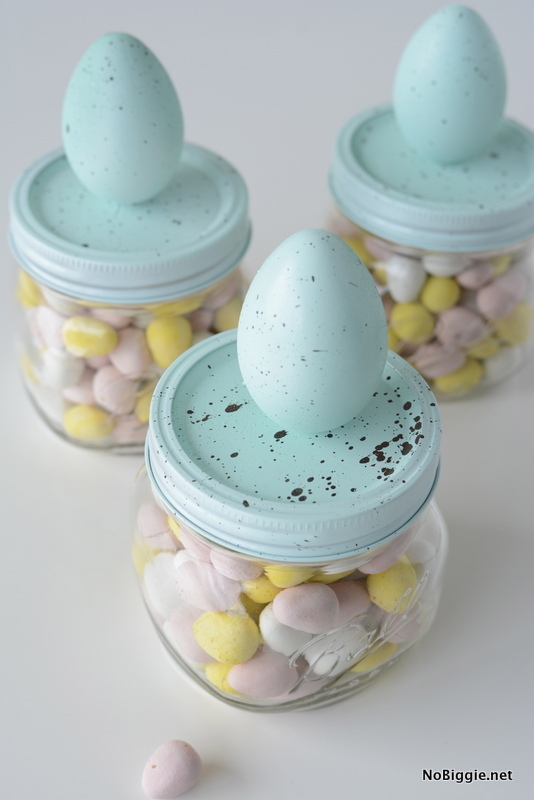 Here’s a fun Easter gift: DIY speckled egg candy jars. 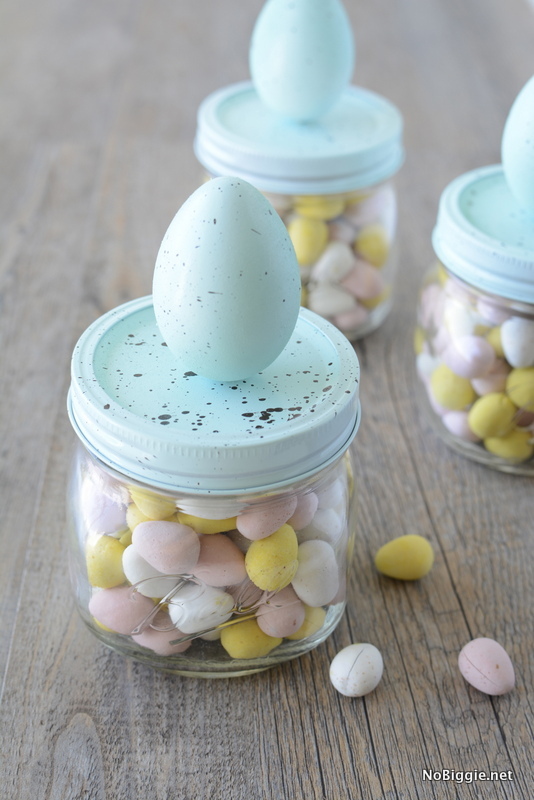 We are on a roll with the Easter candy jar ideas this week, just in time for Easter! 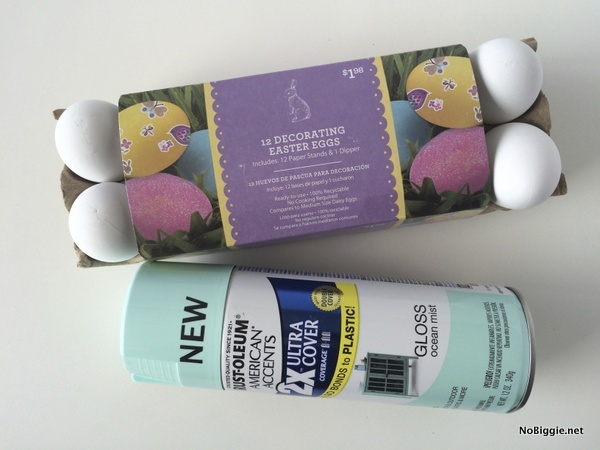 First we shared the chocolate bunny jar toppers, then the DIY peeps bunny jars. 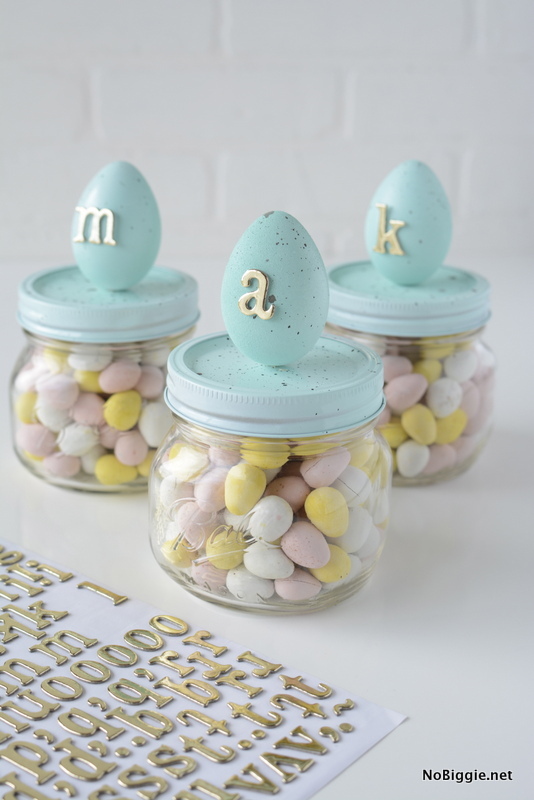 Now here’s a candy jar to celebrate Spring: speckled egg candy jars. 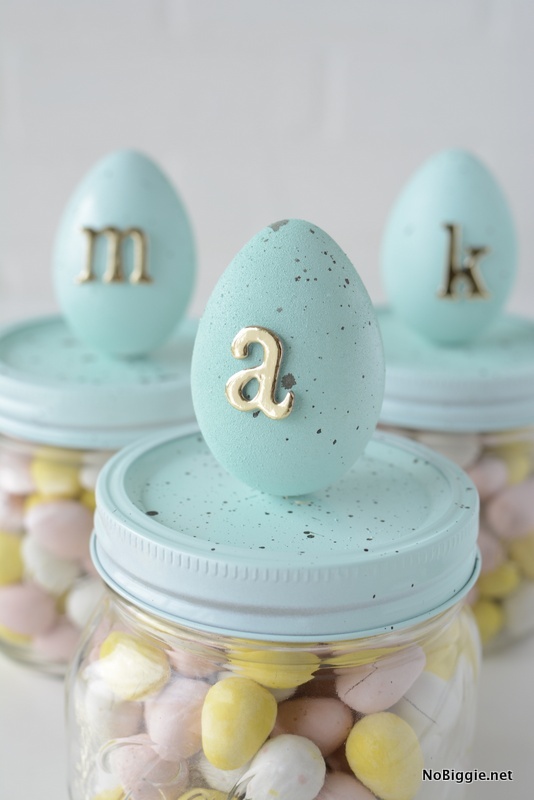 I love the look of speckled eggs, and for this craft, not only is the egg speckled, but the mason jar lid and ring are speckled too to give it a unified look. It’s up to you if you’d like to add a monogram to each one, or leave them without, either way they’re cute! 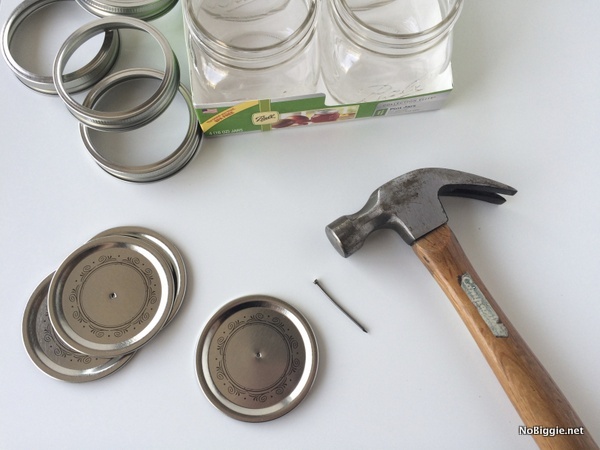 With the hammer and nail, you will need to make a hole in the center of the jar lids. Once you have sprayed the lids, eggs and rings, and let them dry, you will then speckle them. You can either use brown craft paint, or spray paint. Basically you will add paint to something like a piece of tinfoil or something that you can throw away when you are done. 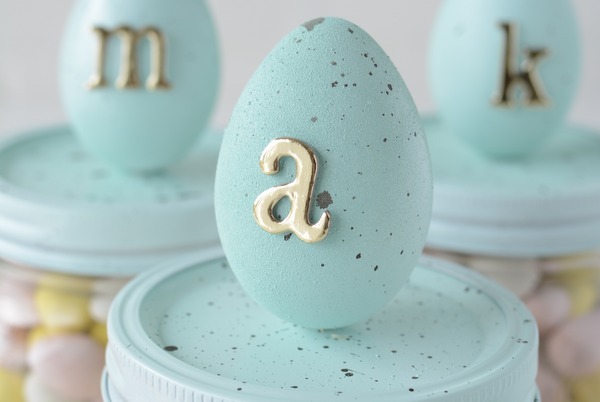 With a small paint brush, you will flick brown paint onto the eggs, lids and rings to give them that speckled egg look. Once all dry, you can assemble the eggs and lids together poking a wooden skewer through the center hole of the lid. You want the skewer to fit tightly in the hole of the lid. 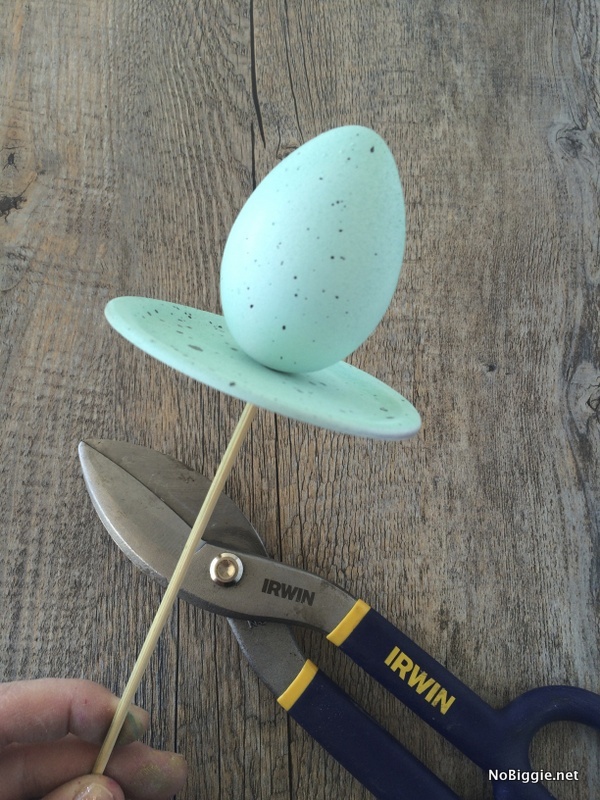 Then poke a hole in the center bottom of the eggs and push the eggs onto the pointed end of the wooden skewer. No glue is necessary. The wooden skewer will hold the egg up right and securely on the lid. Then with heavy duty wire cutters or scissors, you will trim off the excess of the wooden skewer, leaving about one half inch coming out the bottom. You can personalize each one with a monogram, if you’d like for a sweet treat for a friend. Or you can leave them the way they are! Either way, they make a cute decoration and treat. I hope you all have a wonderful Easter with family and friends. Happy Easter, happy Spring…Happy Everything!